1)We've been very busy! It started with the county fair and it's not over yet. It's shaping up to be a very full fall/winter what with weddings, vacays, speaking engagements, and the usual fall church schedule! And being busy means I haven't had time to try out very many new recipes. 2) I'm on a sort of a diet. I've been using the MyFitnessPal app and by counting calories and working out more I've lost almost 15 lb. since May! I feel great and I think I'm starting to look better too. I'd still like to lose another 10-15 though. That being said, I'm eating and cooking a little differently. Not all of the recipes I've tried have turned out very well. 3) It's been summer. I'm lazy. There, I said it. Too lazy to take photos, too lazy to write. So, now that we've got the excuses logged, allow me to introduce you to one of my new favorite "skinny" dinners! Hubby and I just love the freshness of this easy dish! The flavors of the sauce are fantastic and you just can't get over the satisfying crunch of crisp lettuce, cabbage, carrots and smoky toasted almonds. Four of these wraps filled me up and still came in under 400 calories! Serve with brown rice and you've got a light, healthy, satisfying meal that won't add to your waistline! Mix up sauce ingredients until thoroughly combined. 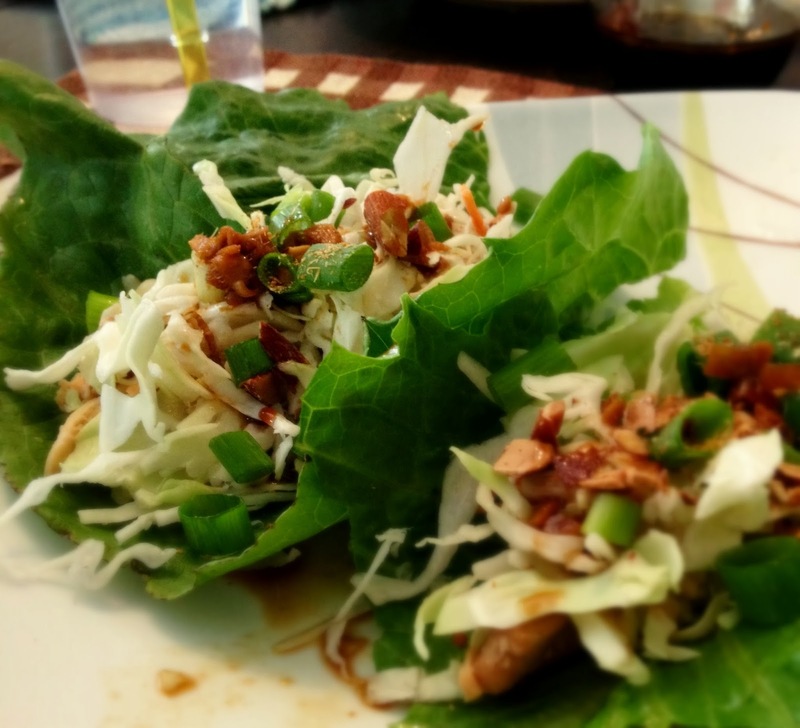 To assemble wraps, distribute filling ingredients evenly among lettuce leaves. Drizzle with sauce and roll.